These quotes from actor William Hurt, scientist Margaret Mead, and singer Usher, respectively, all represent a traditional view of doing good work. Dedication and work ethic are foremost, playing around and lack of focus are the enemy. Popular notions of work may not allow for play, but research has shown that it can have numerous benefits for workers, teams, and organizations. An article by researcher Claire Petelczyc and colleagues explores the existing science of play at work and future directions for its study. Research has found evidence that play at work is linked with less fatigue, boredom, stress, and burnout in individual workers. Play is also positively associated with job satisfaction, sense of competence, and creativity. Studies show that when a participant receives a task that is presented playfully, they are more involved and spend more time on the task. And research suggests that the upsides of play extend beyond the individual. Teams of workers can benefit from play via increased trust, bonding and social interaction, sense of solidarity, and a decreased sense of hierarchy. 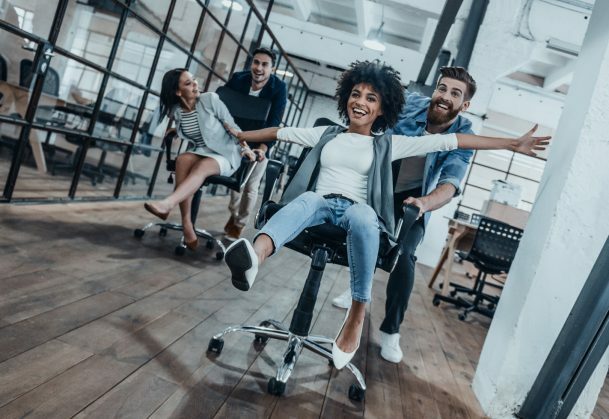 Furthermore, findings suggest that play at work can benefit whole organizations by creating a friendlier work atmosphere, higher employee commitment to work, more flexible organization-wide decision making, and increased organizational creativity. Is highly interactive among play partners or with the activity itself. Building on this framework, Petelczyc and colleagues point out that play at work has some special considerations compared to play in general and play in adults. Part of this distinction comes from the inherent power differences among people in workplaces, from the goal-oriented nature of work and workers, and the unique culture of workplaces. While it might risk taking the fun completely out of workplace fun, a strict, three-rule definition of play helps researchers decide clearly what qualifies as play and what does not. Petelczyc and her coauthors advocate applying Van Vleet and Feeney’s definition to future studies and highlight the need to identify better ways to measure play. Given the spontaneous and loose nature of play, measuring how much informal play goes on in a workplace is tricky, but metrics including the Adult Playfulness Scale and the Short Measure for Adult Playfulness can help measure intensity and amount of play. Petelczyc and colleagues note that previous researchers have paid considerable attention to the positive benefits of play. Of course, if scientists are only looking for the positives, they are likely to only find positives. More research is needed to investigate the potential dark side of play at work. Just like children can get hurt going down a slide, workers playing could cause unintended harm, the researchers write. It is possible, for example, that some short-term positives of play can turn into long-term negatives. An employee may enjoy playing at work in the short term, but finds that she has trouble managing play alongside work to the point of distraction, lost productivity, and guilt long term. Moving forward, Petelczyc and colleagues recommend researchers look more closely at how play affects workers’ use of resources (e.g., time, energy, focus, attention), how employees play to help regulate emotions, and how play fits into reaching their goals (e.g., getting to know supervisors better, networking, building up goodwill with group members). Petelczyc, C.A., Capezio, A., Wang, L., Restubog, S.L.D., & Aquino, K., (2017). Play at work: An integrative review and agenda for future research. Journal of Management. doi:10.1177/0149206317731519. Van Vleet, M., & Feeney, B.C. (2015). Young at heart. Perspectives on Psychological Science, 10, 639 – 645. doi:10.1177/1745691615596789.